Welcome to my gallery of unique gourd art creations. I was introduced to gourd decoration in 2002 and now I’m hooked. 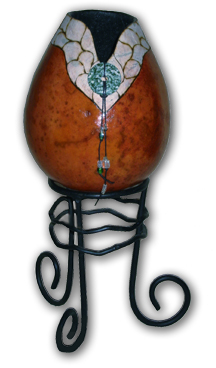 Creating gourd art is fulfilling in many ways. Working with plants and natural embellishments makes wonderful, earth-friendly art. Occasionally I spray a gourd with acrylic or paint, but usually I try to use water base paints, varnish & wax. My goal is to use less toxic products to keep the gourds as natural as possible, while creating something special. A special thanks to my friend Mary for creating and designing such a lovely website. Hope you enjoy all the photos. Click on gallery links below to view my work. Enjoy.